Starting today, I have decided to take it upon myself to review the latest free download from the iTunes UK music store *every week. First review is of ‘Tina Dico’. Now, I know what you’re thinking, “Who? !”, well I was thinking the same… infact, judging by the other free tunes I’ve downloaded in the past, you’ll be saying that [“Who? !”] every week! Anyway, pop over to the rawkstar main page and click the latest mini review “Tina Dico – In the Red”. – Enjoy. *Every week unless I forget, or can’t be bothered… or as with the last 2 weeks the songs have been too bad to feature on rawkstar… and not that I’m lazy. I’ve (slightly) updated the design of the site, I plan on tweaking the design a bit more over the coming weeks so keep an eye out for any errors that creep in! Your views on the design are appreciated, if you spot any odd happenings with the layout etc, just comment here or use the contact form on the main site and tell me what’s happening and in what browser. I have tested the layout in all the latest browsers I can (Firefox, Safari, Internet Explorer 6 and Opera). Spot the recent change and i’ll give you some free mp3s to download 😛 (or not…). One thing that generally annoys me with the state of music journalism and publications is the lack of coverage of post-rock. For the uninitiated, post-rock is a genre in which traditional rock instruments are used to perform classical tasks. That is, a focus on composition, timbres, crescendos and what have you. The songs performed by post-rock artists are typically long, often pushing the 8 minute or over mark, and void of any song. Now, I do realise that there are two million things that sound infinitely better on paper, but bear with me. Post-rock groups like Godspeed You! Black Emperor and Explosions in the Sky have created some of the most beautiful pieces of modern music. Songs that build up from a meagre beginning, only to end in a heart-wrenching crash, boom and a bang 8 minutes later as guitars are throttled, drummers ravage their kits and violins float on top. I was listening to Radio 1 today (Scott Mills show) while driving home from work, they started talking about Wikipedia and how they thought it was amusing to edit other Radio 1 presenters profiles (e.g. saying they’re romantically linked to random people). Now, anyone that knows about Wikipedia, understands that it’s a resource for information, not a page to have a little fun making things up about random people and events and the users and administrators would get slightly pissed… some of it was amusing, I have to admit, but all it did was cause their profiles to be locked and probably their user accounts removed/banned (and probably the entire BBC’s IP address range blocked!). Most people who keep up with the news will have heard about people adding fake data to journalist John Seigenthaler’s biography and other such incidents and know how big an effect it had on the site and peoples views on it. Another thing that annoys me about the Scott Mills show is the people that request songs which have been played about 20 times already that day i.e. Sugababes, Ugly. It’s just pointless. I guess it’s limited to their playlists though… Good thing is, Starsailor are having a lot of airtime lately! (They’re on as I write this) with their new single ‘This Time’. My current love, as far as music is concerned, Patrick Wolf is releasing his third album this year. More details on the musical aspect of the album in the full-length interview i did with the lovely Mr. Wolf elsewhere on rawkstar.net. Some more news have later emerged though. The album will be named “The Magic Position” (the mind boggles…) and will be released on Loog/Polydor. Which means, ladies and gentlemen, that the wolf is going big time. Along with the prospects of a new Biffy Clyro and maybe an Arcade Fire album in 2006, I am very very excited. 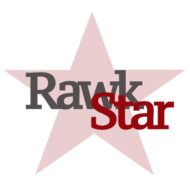 rawkstar.net joins the blogging bandwagon! Yes, I’ve gone and done it now… I set up a rawkstar.net blog for the team to pass on their thoughts of the moment on the world of music e.t.c. and me to ramble about webby things. I know it doesn’t look very nice at the moment, but I will redesign the site when i get around to it – It’ll look more like rawkstar.